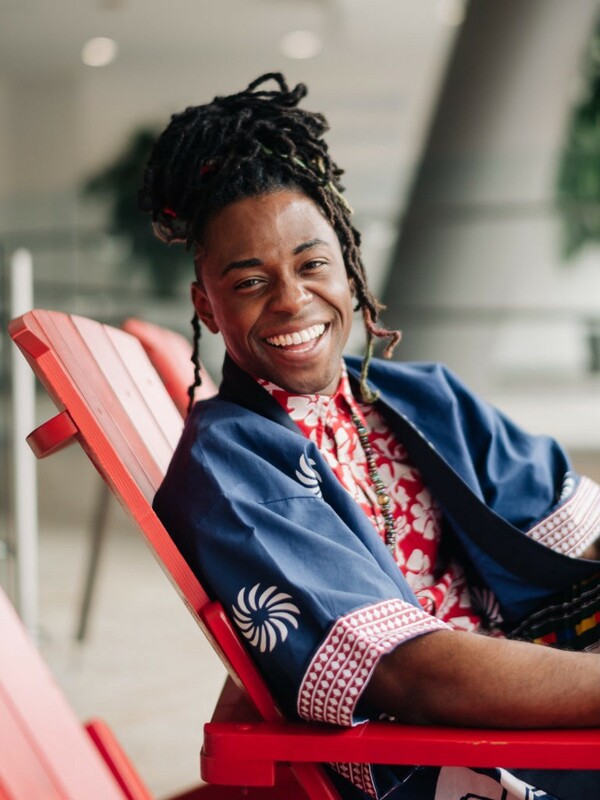 I had the pleasure to interview Lazarus Lynch, host of Chopped U, Food Network’s first Snapchat show and Comfort Nation, currently on Food Network’s social channels and website. Thank you so much for joining us! What is your “backstory”? I grew up with a big family in Jamaica, Queens in New York City. My dad became a chef when I was 10 years old, and I remember falling in love with the kitchen. Whenever my dad cooked, I wanted to be there. My dad opened a soul food restaurant, and I wanted to follow in his footsteps. I wanted to be at the restaurant, learn how to cook, and I started to take it seriously. Before that, I was into painting, music and art. But, culinary arts just sort of entered into my path. I went to Food and Finance High School in New York for cooking, and my intention was to graduate and become a chef. I wanted to share my dad’s recipes and the joy of soul food with the world, so I began to create YouTube videos and other content that shared a new kind of soul food with kitchens everywhere. Can you share the funniest or most interesting story that occurred to you in the course of your career? A lot of crazy and unexpected things happen on shoots. I was at a vineyard of California shooting a BBQ show where I was one of three judges. The contestants were cooking and suddenly it got really windy out of nowhere, so all of the cameras, lights and tents blew away. The contestants were amazing and were somehow able to keep cooking through the chaos, but in a matter of seconds our equipment was scattered everywhere — tents were upside down and rolled down the hills of the vineyard. It took us a while to get situated again. Earlier in the day at the same shoot, I was in my trailer on set when I heard my fellow judge scream from her trailer — a bird had flown into a trailer and made a mess everywhere. When I opened the door from my trailer to see if she was ok, the bird flew into my trailer! Mother nature gave us many surprises that day! What would you advise to someone who wants to emulate your career? I wouldn’t advise people to try to emulate anyone, but there are certain things you can learn from people. It’s important to find what you like do and what you do well. And you just have to do it. Just believe in yourself and find partners who can create with you, who are more talented and have different expertise. However, there’s only one of each of us. There’s only one Lazarus, and one of you — be yourself. If you want to be a chef, my advice would be a little more practical: cook something every day. Something different, something original, and cook because you love it and not because you want to impress anyone or because you want to be cool. Cook because you love it. For me, I love cooking, not just because of the eating — that’s a huge part of it, and a huge reward — but I love cooking for the process of it. I’m always learning, and I’m seeing what the water does when the pasta hits the hot water, I’m seeing what the butter does when it melts in the pan, I’m seeing the sizzles and the bubbles. All of those chemical reactions that are happening is what makes it exciting for my eyes, it’s what makes it exciting for my ears. My senses come to life when I cook. So, try to engage it from that standpoint and all will go well for you. Is there a person that made a profound impact on your life? Can you share a story? Mrs. Mintzer, my elementary school teacher at P.S. 144 in Queens, NY had a big impact on me. I was a really busy kid. (some people say “bad” but I say busy). I always wanted to do different things, questioned everything and questioned adults a lot. It was difficult for me to focus all through elementary school. In 5th grade, Ms. Mintzer was my homeroom teacher and didn’t let me get away with what other adults did. She noticed that I was creative and that I had a talent for art, so she cultivated that talent any time there was an opportunity. She asked that I take on leadership roles and hands-on creative projects whenever they came up. She saw something in me and saw that I needed a way to channel my creativity. She also invited my sister and I to her home and tutored me after school. With Ms. Mintzer’s encouragement, I was able to apply myself to school activities such as ballroom dancing, which was a required class. I eventually went on to join my elementary school’s ballroom dancing team and competed with other schools across NYC. I suddenly became a part of a community and am still a part of the ballroom dancing community today. Ms. Mintzer showed me that I didn’t have to choose between art, math, dancing or any other subjects — I could do all of those things. She changed my life, I will never forget her. I still keep in touch with her to this day. How have you used your success to bring goodness to the world? Are you working on any meaningful or exciting nonprofit projects? 4-H opened up my world, it opened up my heart, it opened up my mind. I learned skills like public speaking, leadership and was exposed to opportunities that allowed me to study abroad in China, as well as organize youth conferences to address hunger. I grew up thinking that college wasn’t even an option for me. I had no examples of college graduates in my life. I had always heard of college, but I thought it was for smart people. I thought it was for people who were not like me. 4-H really showed me that college was for me and that I could do it. I’ve continued to be a part of 4-H and continue to serve nationally for 4-H as a member of the National 4-H Council Board of Trustees and globally as a conference speaker. I’ve also been able to champion 4-H through my work in the culinary industry. When I won the food competition show Chopped on Food Network, I contributed my winnings of $50,000 to my charity of choice, 4-H. They have something for every young person from all backgrounds and continue to make a difference in through a variety of programs. Many people think 4-H is all about agriculture, but it also works in cities (like my experience in New York) and with disadvantaged communities. For example, 4-H’s Food Smart Families creates more food secure homes by teaching kids and families with limited resources how to shop for and cook nutritious meals on a budget. It was obvious to me that 4-H should be the recipient, because of all that it does to change lives and set kids up for success. Wow! Can you tell me a story about a person who was impacted by your cause? I try to empower young people to be themselves by sharing positive quotes and videos on social media — another form of “soul food”. I set up a meet and greet with some of my fans and ended up hosting a girl and her two friends at a restaurant in Brooklyn. They said they learned a lot about food, how to cook and how important it is to be themselves by watching my videos. They started crying and told me about how it’s not always a positive thing to be themselves where they are from and shared how they would get judged and laughed at. Through the positive messages and encouragement, they were able to make changes in their lives. It was special for me to see that my content played a role in people learning, evolving, and becoming more confident. 1. Life is an evolution and the same will be of your career. You may be one place today and want to do something else tomorrow. That’s okay. It’s never too late to reinvent yourself or dream a newer and bigger dream for yourself. 2. Be patient — it’s not going to happen overnight. 3. Finding the right collaborators will require more than admiration of their work. You will need to work with people to see if they’re the right fit and sometimes make decisions based on your gut — sometimes they’re the right partners, sometimes they’re not, and that’s okay. 4. Good things don’t have to be complicated. A project can still be high quality, without a big budget. In the past, when I first started creating YouTube videos, I would sometimes try to make it a big production but found that it wasn’t always worth it — it’s more important to have good quality content. 5. Be 100% yourself. People tend to be focused on how many followers you have, likes, etc. and all those numbers are great but at the core, the brand is who you are. It’s important to offer quality content that is unique to you, establish purpose and intention. It would be a movement to eliminate food insecurity called “Everyone Eats”, which would guarantee that every child has food to eat no matter what. I’d want it to impact every country and school. It would erase food insecurity especially in children. By eliminating food insecurity, the movement would help people around the world become healthier and benefit from the ripple effects of alleviating hunger. I say it before every speaking engagement, before a shoot, before I do anything public or in person, when I visit schools. When I say it, I’m meeting the moment and allowing something greater to happen. I’m establishing my intentions to bring the most good to everyone. Michelle Obama. She is truly every woman, she’s a Renaissance woman. She’s a powerful woman who knows herself and knows her value and has done a lot of good in the world. I would love to make a meal for her and ask her about her role in the world, her purpose. So, Michelle, if you’re reading this, let’s make this happen! Oprah is someone who has inspired me to live a more conscious life, a more centered life. She is someone in my field of media who has not allowed the media to dictate who she is and what she does. She’s a leader of change and makes an impact on all kinds of people. She follows her heart.